Happy New Year everyone ! … and I am hoping this is going to be a very good year for us all. The last few weeks, especialy the run up to Christmas and New Year’s Eve, saw me so engaged in PPE (planning, preparation and execution) that I had little room in my mind for blogging — an activity, as you may imagine, I really enjoy or else I wouldn’t be doing it for so long now. I have become more closely acquainted with some fellow bloggers over the years and the fact that I got to meet a few in real life is a bonus that makes it even more worthwhile an activity. One virtual friend whom I have yet to meet in person is Frank Fariello, and if you don’t already subscribe to his “Memorie di Angelina” website, hurry up and do so, you will not be disappointed. I find that we often write about the same Italian recipe and it brings a smile to my face. His post today about rice and lentils (see link: http://memoriediangelina.com/2015/01/09/rice-and-lentils/ ) reminded me that when making this same dish a couple of months ago, I had used up the leftovers to make some fritters. The result was most un-Italian but since they tasted so good, I think it is worthwhile blogging about them. 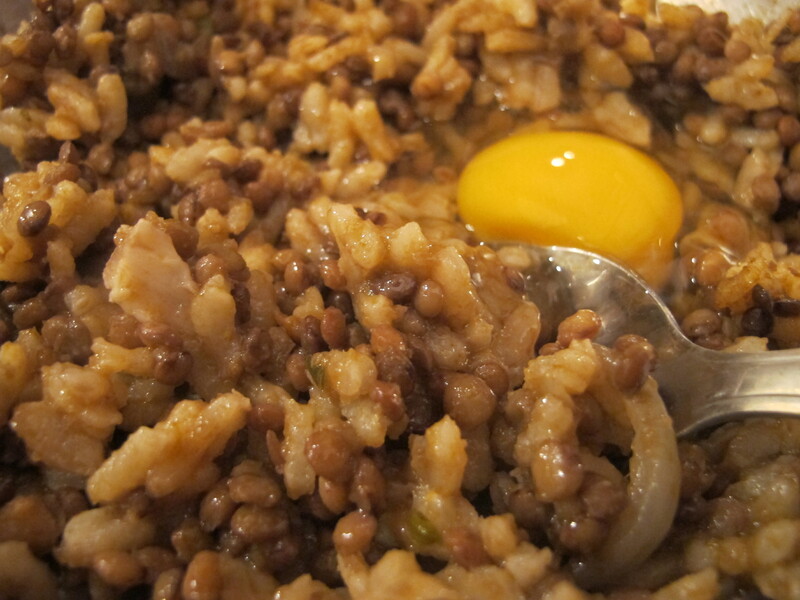 Here are the remains of what once was ‘riso e lenticchie’. The food was at room temperature. I reached for some curry powder. 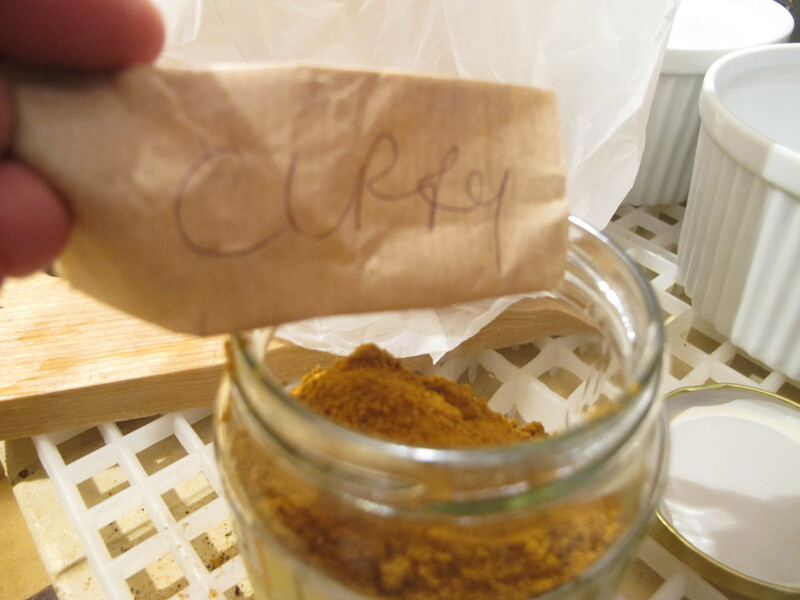 I added a couple of teaspoons of curry powder as well as an egg. Then mixed it all together. I expect I tasted it at some point, and probably added a little salt. 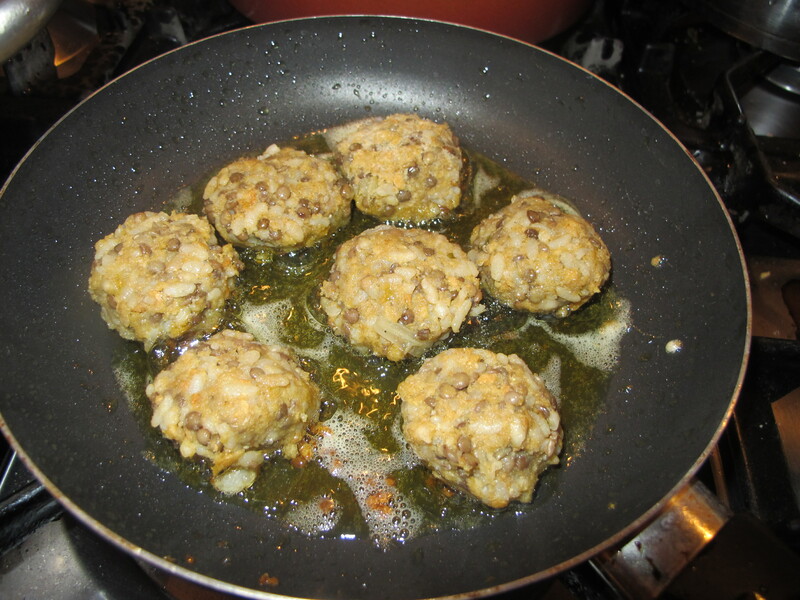 Having shaped the mix into fritters/patties, I proceeded to shallow fry them with some olive oil. Here are the fritters in the serving dish. 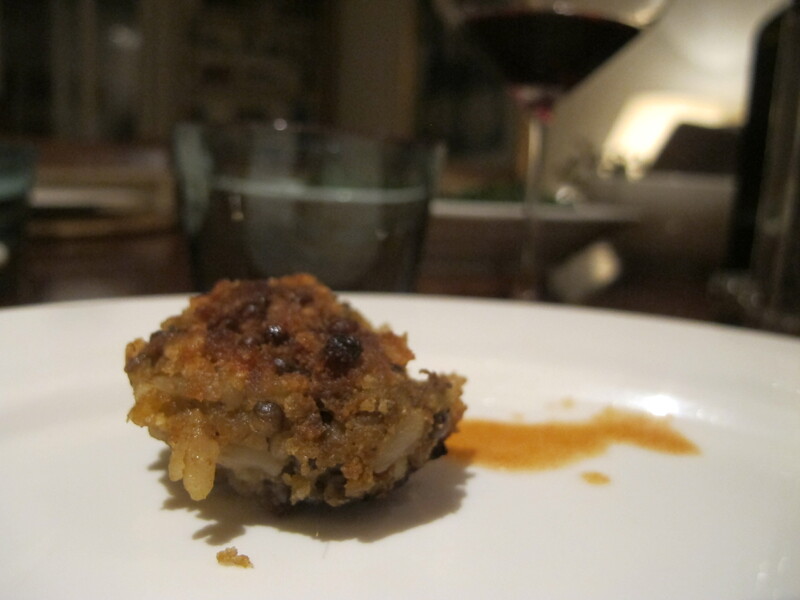 And here is a solitary rice and lentil fritter on a plate. The dark sauce oozing away in the background is Worcestershire sauce. Surprisingly good ! 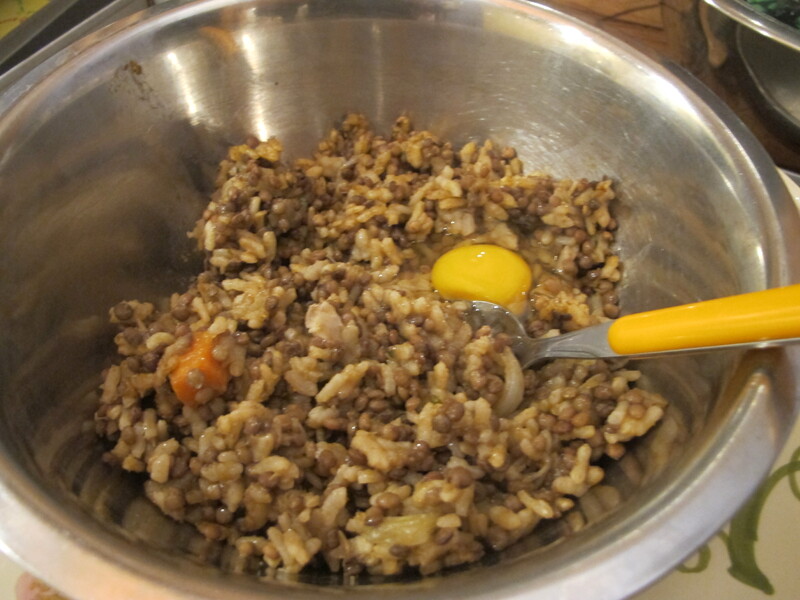 Italian rice and lentils, curry powder and Worcestershire sauce …. ehm … er.. the mind boggles. What was it exactly that I was harping on about in my last post on fusion cooking, eh? Cooking can be so humbling. 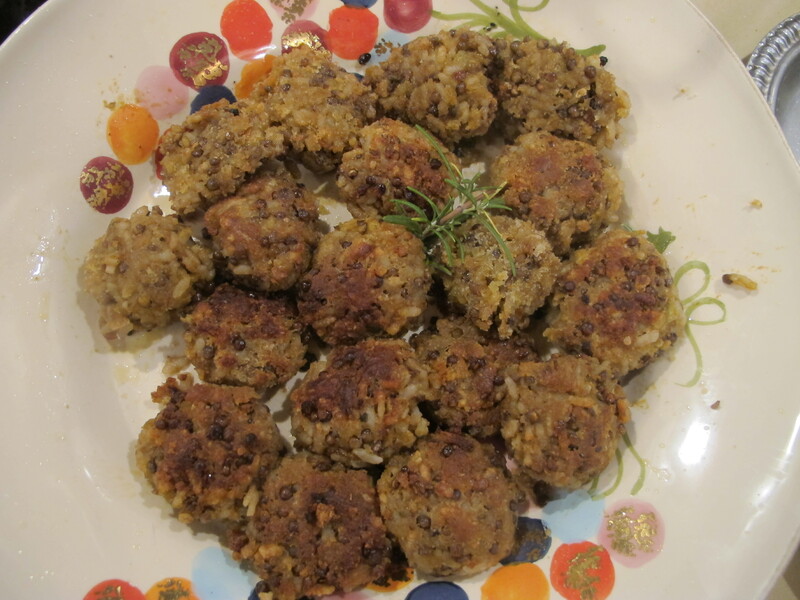 This entry was posted in Antipasti, Loving the Leftovers, Recipes from outside Italy and tagged curry powder, Frank Fariello, olive oil, rice and lentils, worcestershire sauce, www.memoriediangelina.com. Bookmark the permalink. Oh, I really love this use of leftovers. Fritters are just the perfect way of making everything special! Aren’t they just ! Hey … how is your studying? have you finished? Bonne année ! Thanks for the shout out, Jo! It really is striking how many times I see my favorite dishes here and read so many thoughts here that I share. I think we may be culinary soul mates! …what’s next? Tandoori Bucatini all’amatriciana? …well, I think that sometimes it is healthy to break the rules…cretinate a parte/ nonsense aside, today I was reading an interesting observation about the concepts of “authenticity” and “traditional” by Victor Hazan (on the M. Hazan Fb page) – really worth tracking it down.